There is relatively limited knowledge on the impacts of bulk marine sediment mining on marine environments. However, preliminary assessments, undertaken in other countries, outline considerable and irreversible impacts on marine ecosystems and fishery resources, signifying the need for longer term investigations. These studies say that likely devastating impacts coupled with lack of knowledge on bulk marine sediment mining, warrant extreme caution. Prior to the Green Flash Trading prospecting rights being granted, WWF-SA commissioned a report on potential impacts of marine sediment mining in the west and south coasts of the Western Cape. The report found that bulk marine sediment in the Green Flash Trading prospecting areas would have severe and potentially irreversible impacts on seabed habitats. The destruction and permanent alteration of marine habitats would be inevitable in light of the type of mining proposed. Habitat destruction and resultant ecosystem changes in mined areas could be permanent, as recovery to pre-disturbed states would occur only on geological time scales. The report found that marine phosphate mining could cause significant and irreversible impacts to biodiversity, ecosystem functioning and fishery resources. 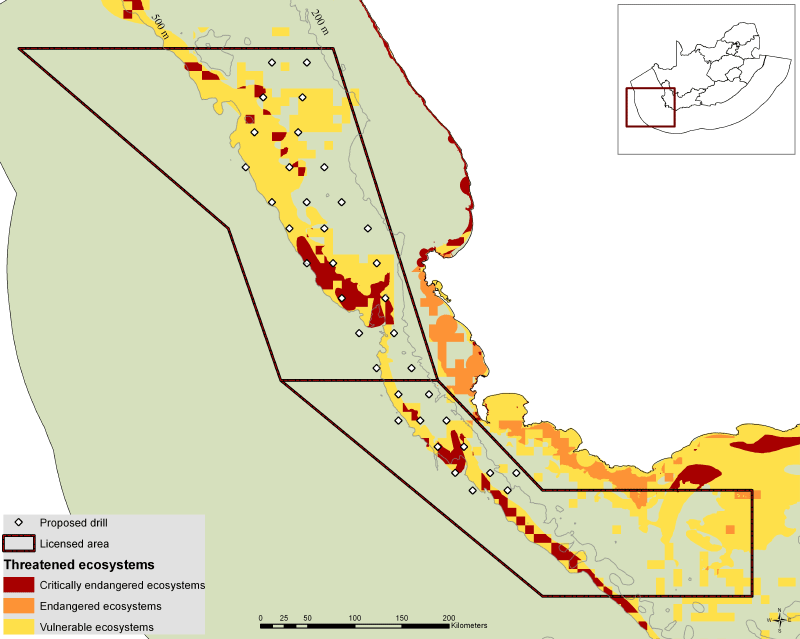 In particular, the prospecting rights for marine phosphate mining directly overlap with critically endangered ecosystems, ecologically and biologically significant areas and habitats earmarked for protection under an Operation Phakisa initiative to establish a network of marine protected areas. Some of the benthic habitat types that coincide with the prospecting areas don’t exist anywhere else. As seabed mining would have significant impacts on fish stock it would also impact on revenue, jobs and livelihood associated with the fishing industry. It is thus important that the socio-economic contributions of fishing are understood and considered in decision-making on seabed mining. 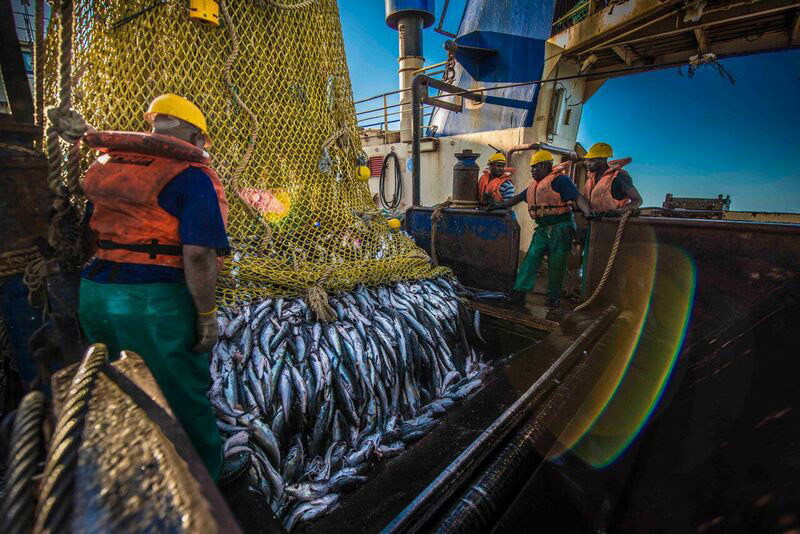 South Africa’s commercial fishing industry employs approximately 27 000 people directly and 100 000 people indirectly. 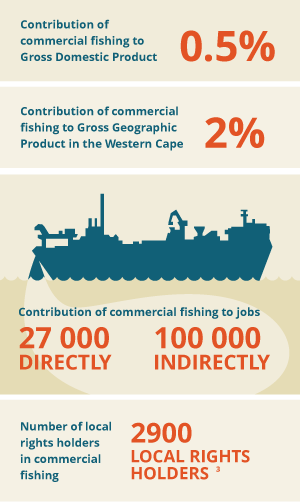 In the Western Cape, where the prospecting rights are concentrated, the fishing industry contributes approximately 2% to Gross Geographic Product. The marine phosphate prospecting areas directly overlap with fishing footprints of several fisheries including hake longline, tuna pole, west coast rock lobster, small pelagics and chokka squid sector. Together, these five fishing sectors provide up to 23 000 jobs. Notably, the prospecting rights coincide with South Africa’s only Marine Stewardship Council accredited fishery, which employs 12 000 people and generates approximately R4 billion in revenue annually. This industry has operated for approximately 120 years, creating thousands of jobs. As a renewable industry, it could continue to do so in perpetuity provided the trawling grounds are not destroyed by seabed mining. Furthermore, latest estimates suggest that the there are approximately 8 078 small-scale fishers in South Africa, with the Western Cape home to approximately 1 667 small scale fishers. Small scale fishers directly rely on heathy marine ecosystems for livelihood, nutrition, food security and income. Small scale fishing plays a critical role in providing employment and access to protein in coastal communities. There are approximately 44 coastal communities dotted along the coastline of the Western Cape. Marine phosphate mining will likely have considerable detrimental impact on tourism, particularly coastal and marine tourism. Bulk marine sediment mining requires additional coastal developments that have associated impacts. These include desalination plants, beneficiations facilities and processing plants as well as increased shipping. In relation to the Sandpiper Project, residents of Walvis Bay were highly ‘concerned about the potential release of toxic elements in the land-based phosphate processing phase’. Bulk marine sediment mining off the West Coast and Agulhas, would likewise negatively impact on coastal tourism in these areas.